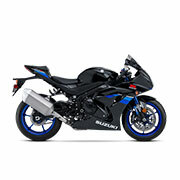 When looking for an option sure to excite with every ride, Suzuki motorcycles are a top choice. Made to offer impressive speed and stability coupled with all the thrill and torque adrenaline seekers crave, this lineup of bikes has a long history of excellence and a widespread fan base. When shopping for Suzuki motorcycle parts for one of their intrepid models, we have you covered with all the essentials you could possibly need. The story of Suzuki motorcycles dates back to 1952 when the manufacturer introduced their first motorized bicycle. While this wasn't what we think of as a motorcycle today, it was the groundwork for things to come from this innovative manufacturer. In 1953, they introduced a relatively unknown model to today's casual fan, the Diamond Free, which was an air-cooled 58 cc 2-stroke bike with two speeds and two horsepower settings. While this model didn't achieve popularity, it was the blueprint for improvements made to create their S models in 1958 which would change the game both for the brand and the industry. From there, Suzuki introduced several models and pioneered exciting new advancements in motorcycle designs which would make them a leader on the scene. For example, they were the first in the industry to introduce a 250cc, two-stroke twin model in 1965 and then the first four-cylinder bike in 1976. The brand was focused on giving riders and racers alike a bike that was sleek and speedy while also offer power and control for a total package. By the time they created their sleek motorcycles such as the newly designed GSX-R 750 and Hayabusa, the market counted on their brand for reliable and fun motorcycles, but Suzuki saw new opportunities worth exploring. When they introduced their GSX-R1000, a sleek sports bike offering a new take on motorcycle designs, the industry set a new course. The sports bike had appeal for adrenaline seekers, everyday riders, and competitive racers alike which made it an instant success. From there, the brand has continued to modify earlier designs and create new standards alike for a lineup any motorcycle fan is sure to appreciate. When shopping for Suzuki motorcycle parts for your bike, we are honored to play a role in your story with this innovate manufacturer. We offer one of the largest selections of Suzuki motorcycle parts to help you maintain the power and performance of your bike. With a brand as evolving as Suzuki, we know there are few similarities between a bike model produced in 1979 and one produced in 2018. With this in mind, we offer a wide range of years covering a stretch of time from 1973 all the way to the most current models. In addition to offering a wide range of years and models, we also offer nearly every series within the models to ensure you get the right part for your exact bike. Whether shopping for your Bandit GSF1200 or your Bandit GSF1200Z, we have you covered with solutions sure to please. In addition to offering a diverse selection in terms of models, years, and series, we also pride ourselves on the wide range of available product types we carry. We offer solutions for all the main areas of your bike including the engine, brake system, transmission, carburetor, battery, fuel system, and more. We also offer important frame and body solutions such as foot rests, guards, wheel bumpers, and more for an inventory covering the total scope of your ride. Whether you are searching for valves, bearings, guide chains, or swingarms, we have you covered with all the necessary Suzuki motorcycle parts all in one convenient place. Best of all we offer OEM solutions which ensure the exact fit and performance outcome for your vehicle as what the manufacturer originally intended in their designs. These solutions are high-quality choices sure to offer a great outcome and overall longevity. Order today and get back to riding your favorite set of wheels. We are committed to delivering great products and outstanding customer service with every order. If you have any questions, please contact us for further assistance. We are happy to assist you in any way in finding the best solution for your vehicle.